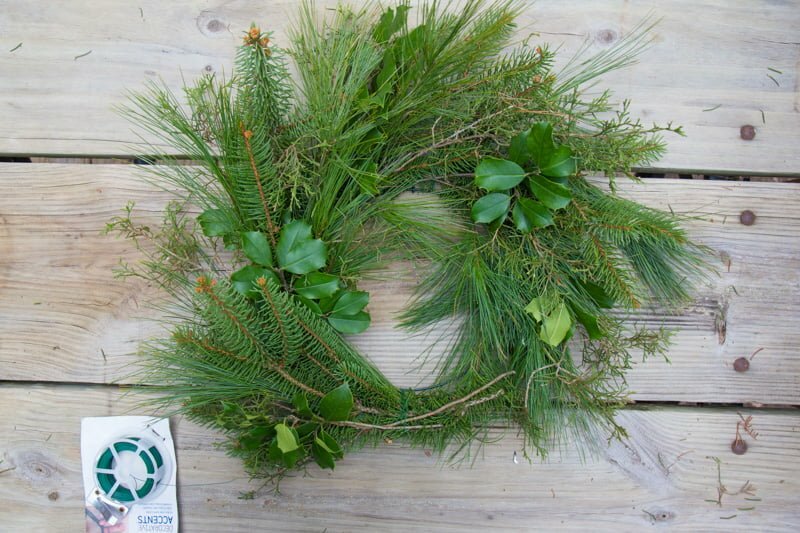 If you happen to have an evergreen tree nearby, a few bucks, and about a half hour, I can show you how to make your own beautiful, festive fresh greenery wreath for that front door of yours. 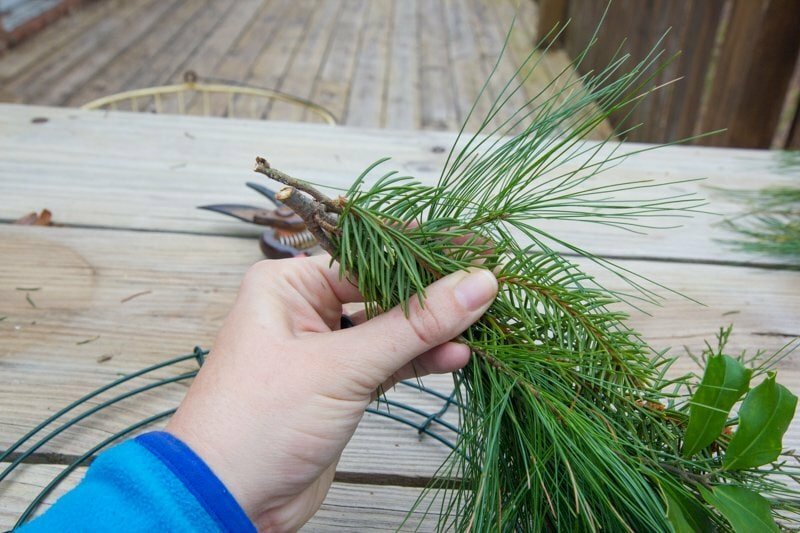 I get that a lot of people don’t have access to evergreen trees to cut off greenery, and that’s probably why the grocery store sells greenery wreaths for a pretty penny, but if you do happen to have a pine or spruce tree that you can clip a few branches from, you can easily make your own. 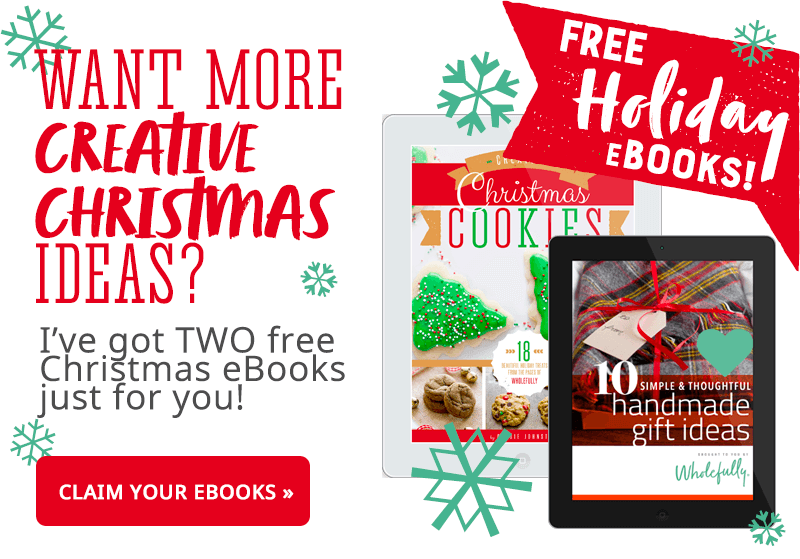 It’s a fun, fast, festive, and frugal craft (my favorite kind). And if you don’t happen to have 30-year-old pine trees like we do, check with your local Christmas tree lot or farm—many of them give away greenery for free! I’m going to dive right into this tutorial, so let’s get started. 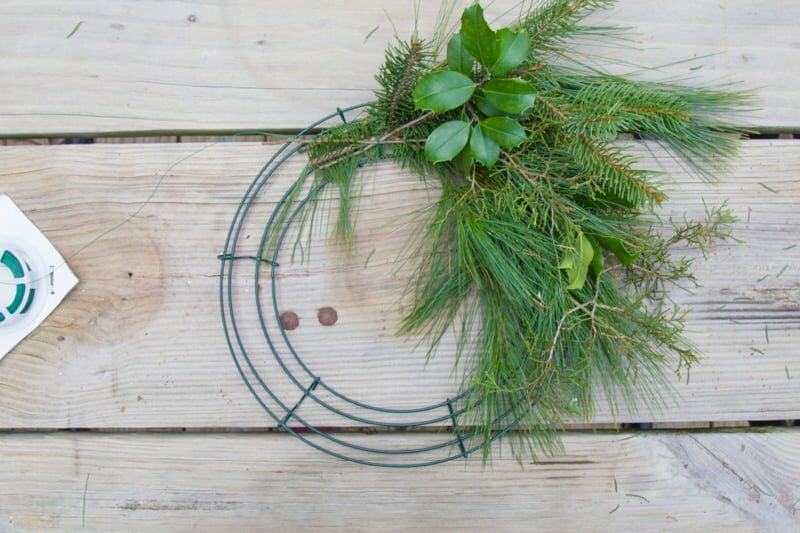 Here’s what you’ll need to make your very own fresh greenery wreath. 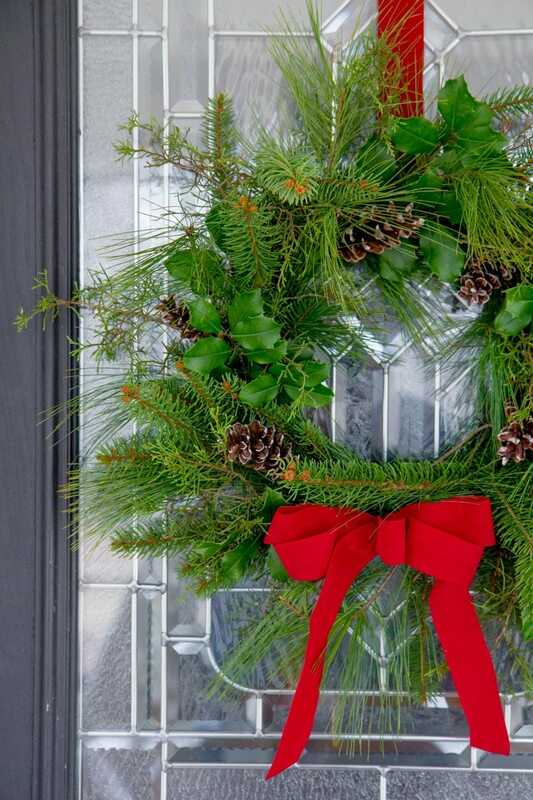 12″ Metal Wreath Form (like this)—You can make a metal wreath form from a wire coat hanger, but honestly, I think it’s worth the $2 to buy a pre-formed one at a craft store (Michaels, Hobby Lobby, and Joann’s all carry them). 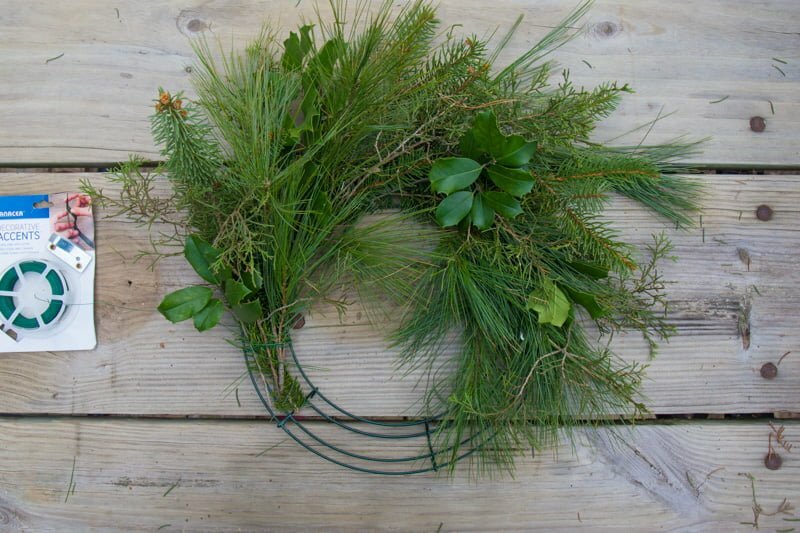 They are perfectly formed and sized for fresh greenery wreaths and you can use them year after year. 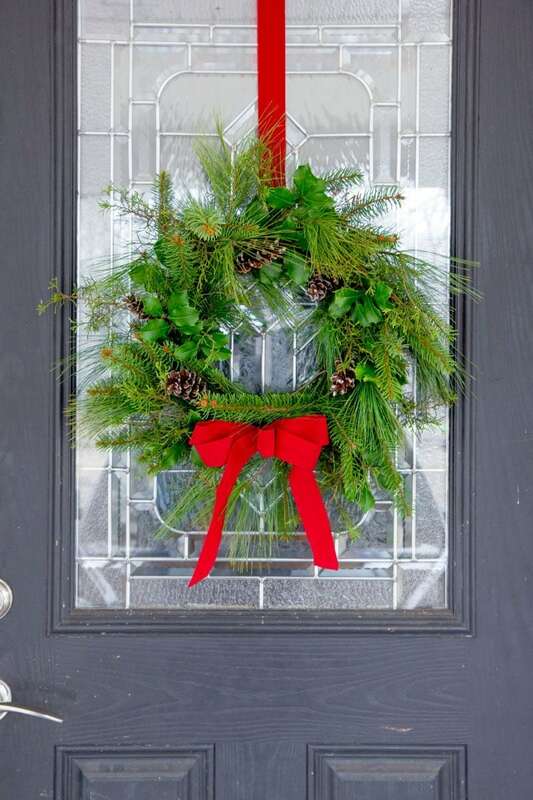 A 12″ wreath form might look small, but once the greenery is on it, the wreath will be plenty big for a regular width door. Floral wire (like this)—Green coated is the best (because it’ll be camouflaged in the greenery). Also, if you can find a package that has a built-in cutting tool, you’ll be forever grateful. Again, all the craft stores—and many discount stores—will carry this stuff near their artificial flowers. Fresh greenery cut into 6–12″ sections—Pine, spruce, holly, cedar, magnolia—whatever makes your heart go pitter-patter. I like to use a mix of greenery from different trees around our property. 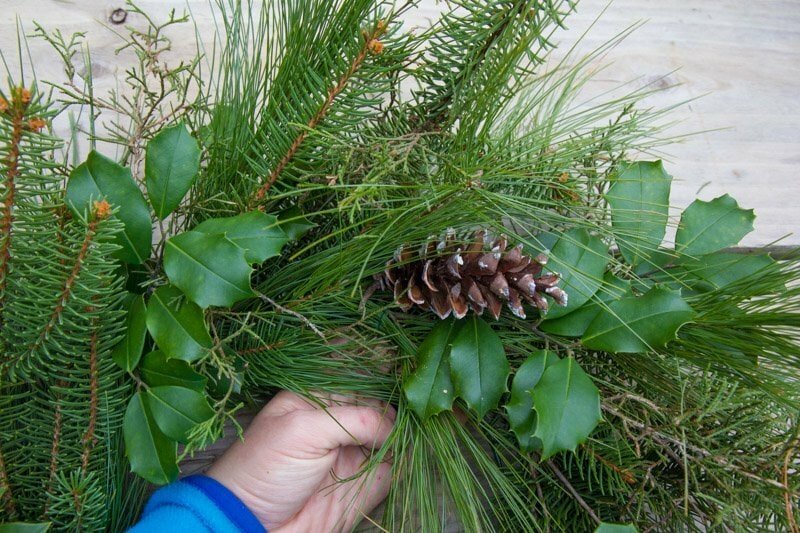 Pine cones, ribbon, and other accoutrements—A simple fresh greenery wreath is beautiful on its own, but if you want to dress up your wreath with pine cones, ribbon, birds’ nests, twine, or bows, you can. 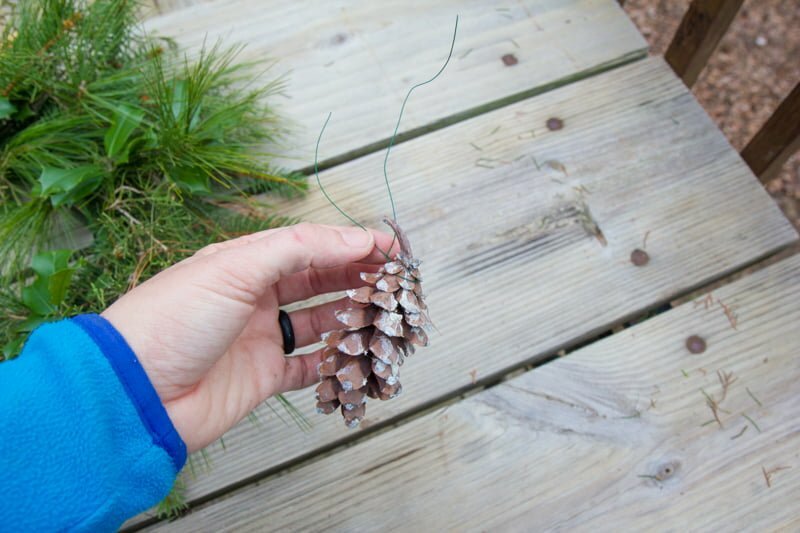 We gathered some pine and spruce cones from our trees. Lay out all your supplies in your work area. 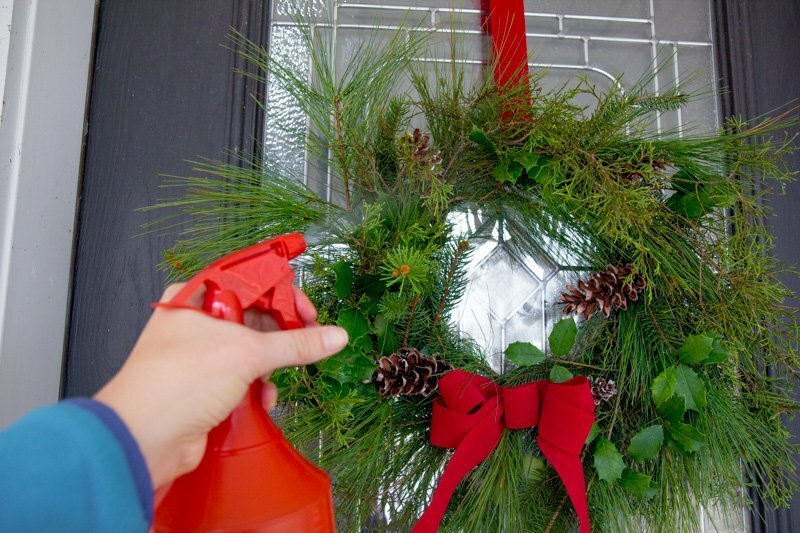 I like to do this outside so I don’t get pine needles everywhere, but if it’s super cold where you are, you might want to do this in a garage or basement. 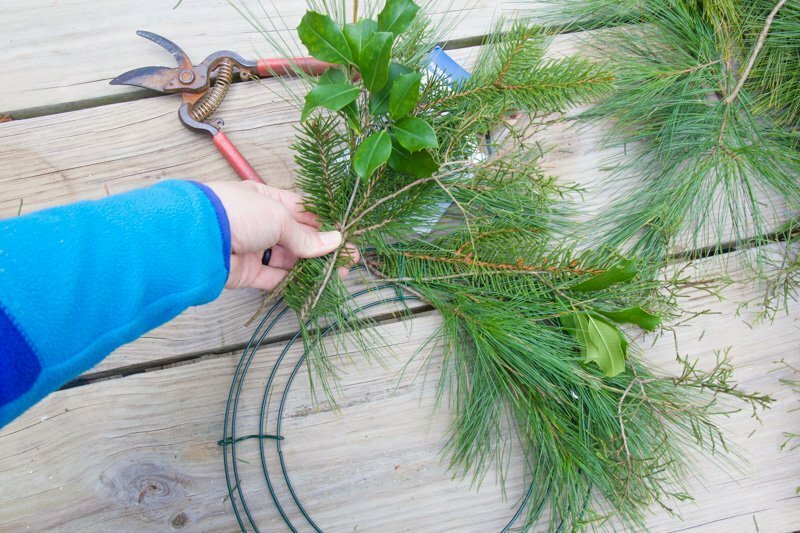 Start the wreath by taking a few different boughs of greenery and bunching them together at the base of the branch. Take the bundle, and place it against the wreath form. Use your floral wire to wrap around both the bundle and the form a few times, until it feels secure. Do NOT clip the wire when you are finished. Make a second bundle, and layer it over top of the last bundle, so the fluffy “tail” end of the bundle covers the wire of the first bundle. 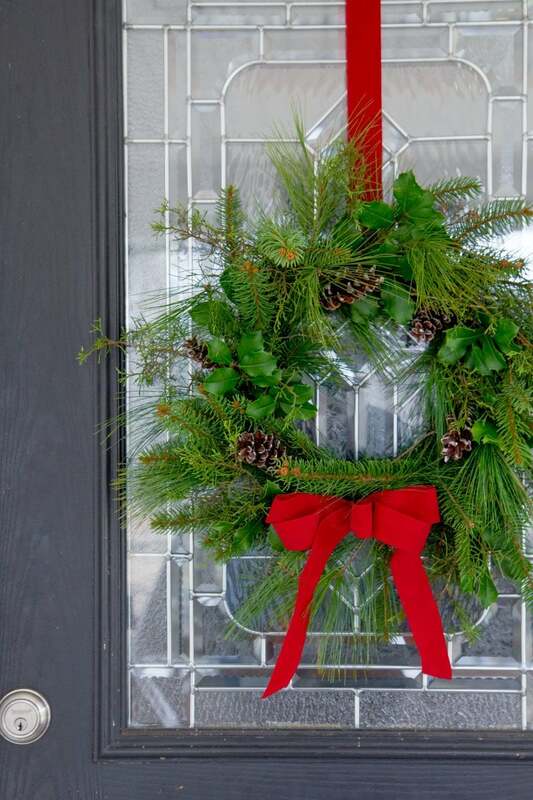 You’ll probably want to move up the wreath form two inches or so. 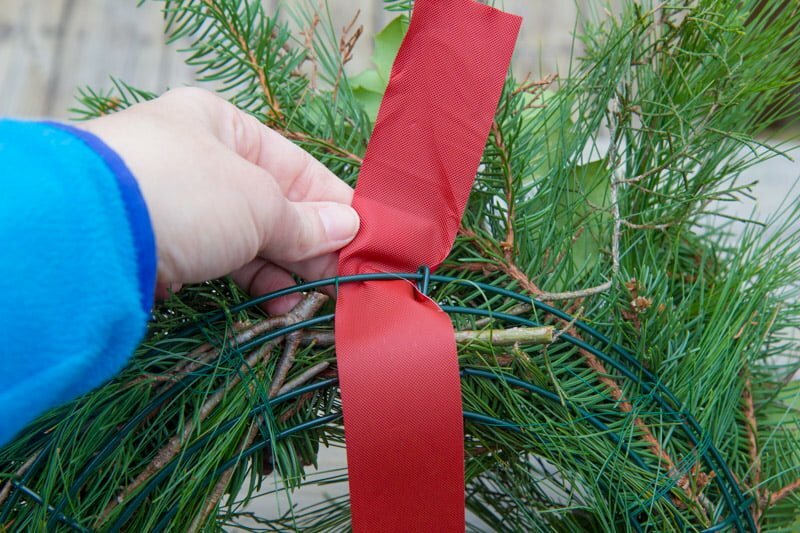 Grab the wire, and wrap it around the second bundle and the wreath form until secure. Again, do not cut the wire when you are finished. See how it’s starting to form? The next bundle you add on covers the previous bundle’s wire. 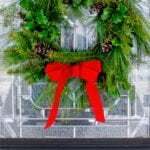 Repeat the process of bundling, covering, and attaching all the way around the wreath. Once you get to the last bundle, just tuck the stem/base of branch end under the very first bundle’s greenery. 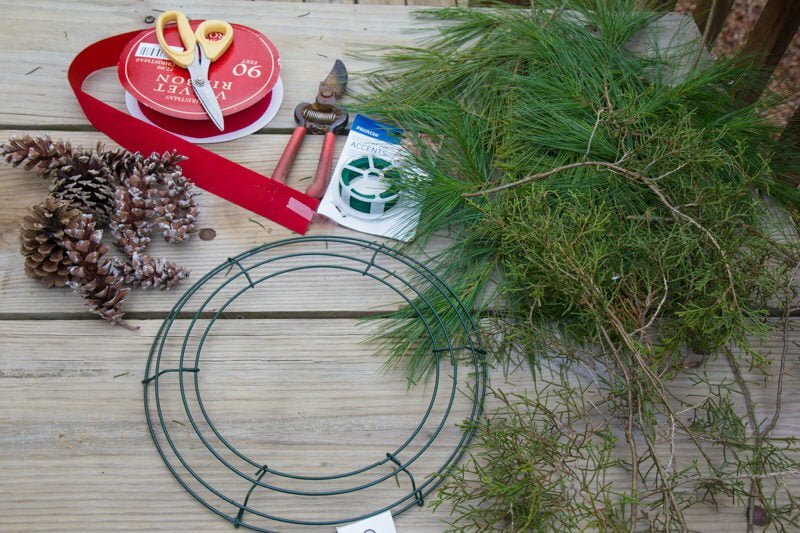 And then take your wire, and wrap it around the base and the wreath form. NOW you can clip your wire. And then fluff all the greenery so the wreath looks all nice and full! Grab whatever decorations you’d like to add, and attach them using small pieces of floral wire. Like, for example, with my pinecones, I just ran a wire through the pine cone. And then placed the pine cone where I wanted, and twisted the wire through the back onto the frame, making sure to tuck the extra wire in the back so it couldn’t be seen from the front. Do the same thing if you want to add a bow. 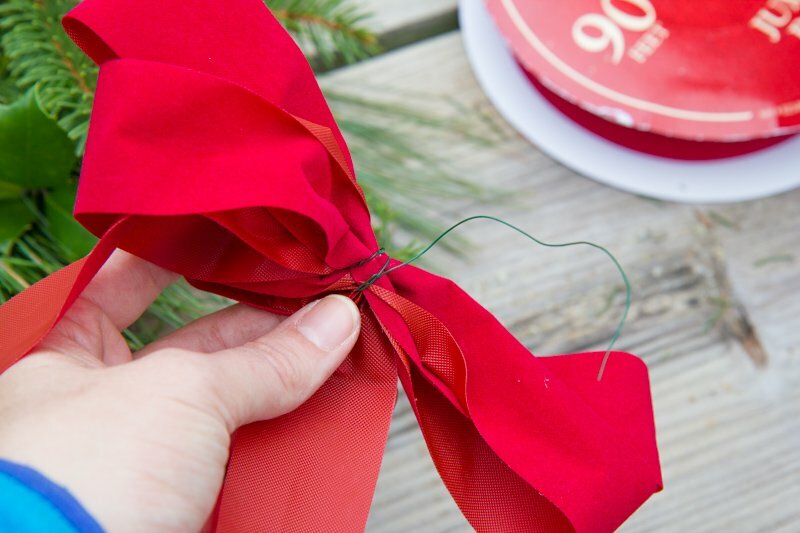 Tie your bow (or take a pre-tied bow), loop a strand of floral wire through the back, and then tie it onto the wreath form. Step Five: Hang and enjoy! All that’s left is to hang that baby up! 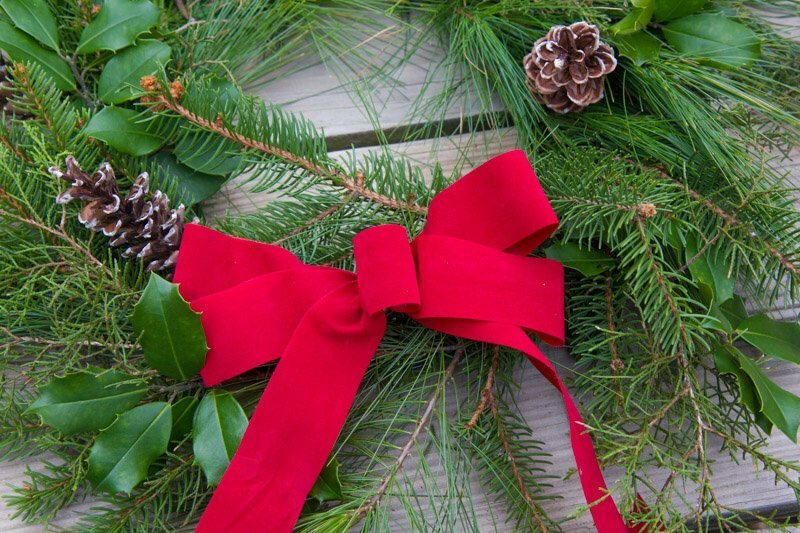 You can just plop the wreath form onto a wreath hanger, or, if you have wood doors, you can do what I do and run a strand of coordinating ribbon through the back of the wreath form. 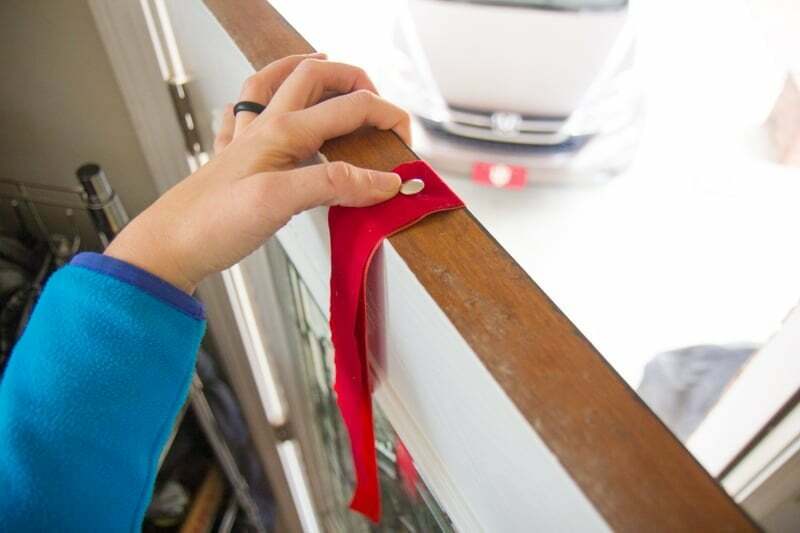 And then use a flat thumbtack to attach that sucker to the very top of your door. Just make sure to really get the thumbtack flat so the door opens and closes smoothly. Step back and enjoy your beautiful creation! 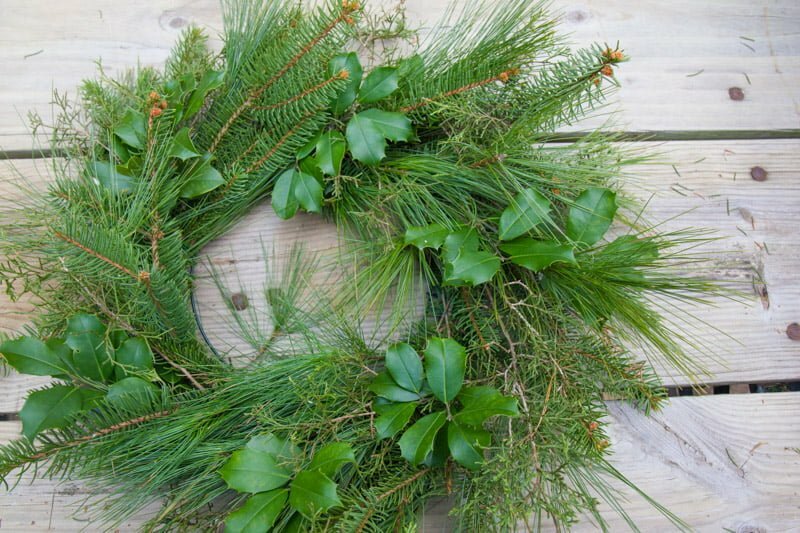 Fresh greenery wreaths kept outdoors do a marvelous job of “keeping” well in cooler temperatures. My only recommendation for care would be to spritz it with water every few days to keep the needles from drying out. Honestly, I normally am really good about doing this for the first week I have the wreaths up, but then I fall off the misting wagon and they still look beautiful all the way into the new year. If you live in a warmer climate, you might have a shorter lifespan and need to mist more frequently. 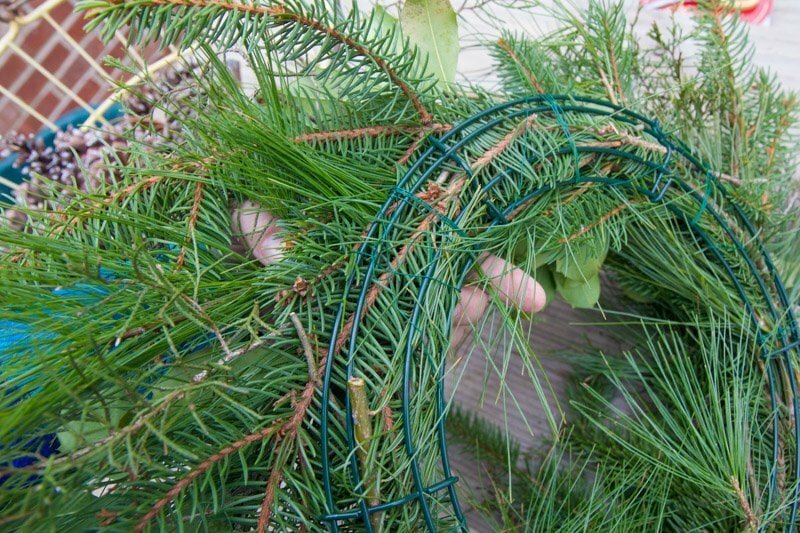 Once you are done with your wreath, flip it over and use wire cutters to snip through all the lines of wire on the back. 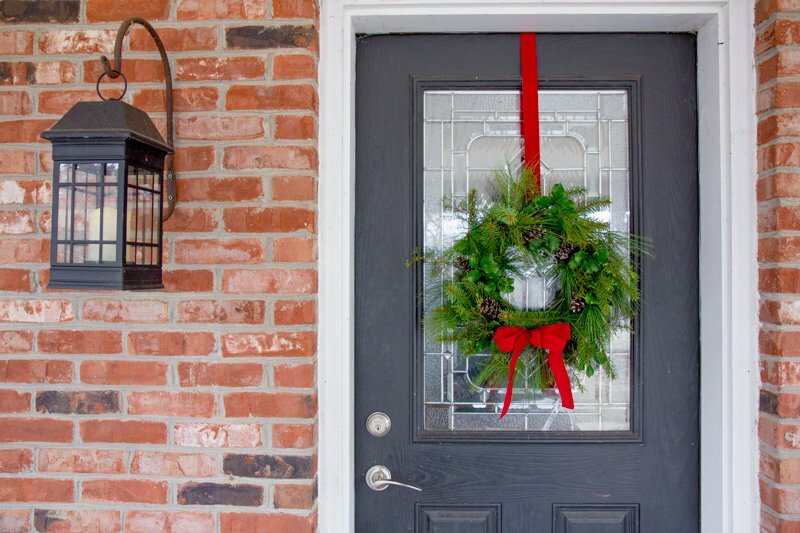 Remove the greenery, wire, and decor, and store the wreath form until next year. And that’s that! I’ve been doing these fresh greenery wreaths for years, so I’ve gotten pretty speedy at it! Each wreath took me exactly 12 minutes to put together start-to-finish (I timed it like a weirdo), and it took me another 20 minutes or so to gather the greenery, pinecones, and other supplies. Not too shabby! And the best part? I have a TON of fun making my wreaths each year! It’s one of my favorite craft projects on my holiday agenda each December. 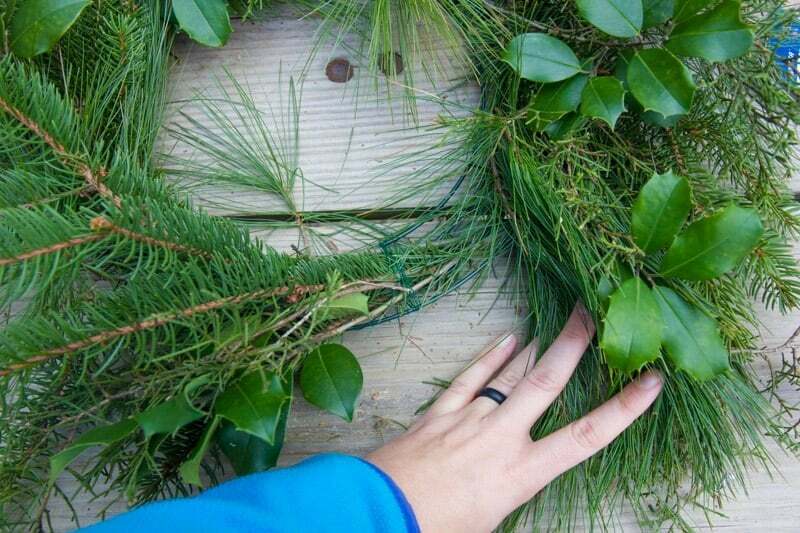 I do stuff like this because it makes me super happy, but if something like this wouldn’t bring you joy, put down some cash to buy a fresh greenery wreath (or don’t) and go find something else to do that does make your heart sing! I believe we put too much pressure on ourselves during the holiday season to be the perfect bakers/ crafters/ gift-givers/ philanthropists/ decorators/ hosts/ family members/ friends. It’s impossible to be perfect at everything (or, honestly, anything)! So do the things that you love to do and that bring you joy, and put aside the things that don’t—without an ounce of worry or guilt. That’s my secret to truly enjoying every second of this most glorious of seasons. Happy holidays! Perfect timing, Cassie! Thanks! I had just been thinking it would be fun to make my own wreath this year, and bam, you’ve got a tutorial! 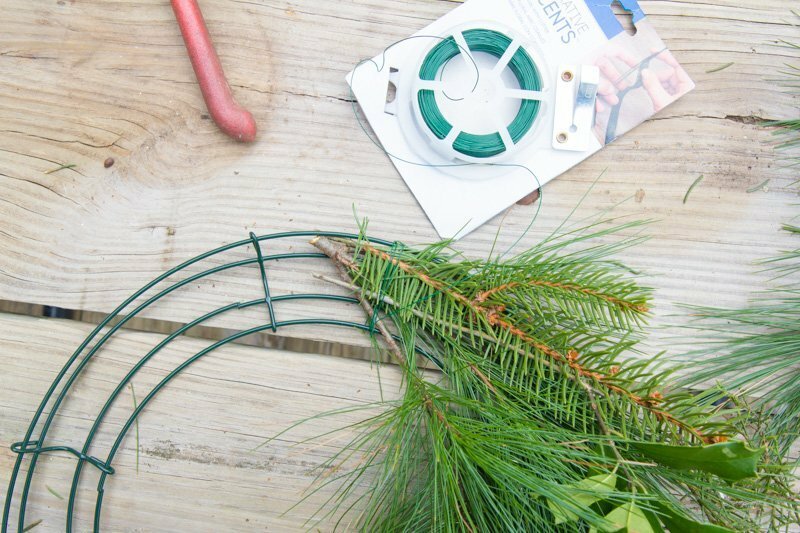 Do you have any idea how many feet of wire you use to make one wreath? We are making 42 wreaths and trying to figure out how much wire to buy! I’m sorry, I don’t! I’ve never measured. I will say that I can get multiple (2-4, depending on size) wreaths out of one of the small rolls of floral wire. Which ones aren’t working for you? They seem to be working on our end, but I can troubleshoot for you if you let me know!